There are times the arrogant person is much easier to like than the one who doesn’t treat themselves with respect. It happens in various ways, but you can feel yourself inching away from someone who gives you clues that they don’t care much for their own self. A person who respects themselves will face issues and conflict. A person shows respect for themselves if they take responsibility for their own decisions and actions. Your choices are not someone else’s fault. Ever. Admitting your errors is respectful to yourself. Speaking clearly and not sending out confusing messages is respectful. A person who respects themselves accepts (even asks for) help when they need it. Recognize your own strengths … and limitations. It is respectful of yourself and others if you accept praise, appreciation, and recognition, gracefully. By these standards, do you show yourself respect? We need to check ourselves on occasion because it is hard for others to respect us if we don’t show the same. Just something to think about. Here’s something else to think about … you need to be able to laugh at yourself. I called Clinton at the The Garage last week and told him the air conditioner in my car was broken. He seemed to understand the amazon lady didn’t handle the heat so well, so he walked over, took my car to the shop and was back in a short time with the car. Handing my keys to me, he told me I just needed to set the temperature down. Whoops. You mean I accidentally hit the temperature and there was nothing wrong with it? I got embarrassed and Clinton got to take another walk. The man is a saint because he just acted as if people made those stupid mistakes all the time. Laugh. It’s funny. You and I make mistakes and sometimes we do stupid things. It doesn’t mean the world is ending or that we’re always stupid. Several things happening around town that you should consider participating in. Go to www.tcec.coop and click under the “Our Community” tab to find out about the recipe book they are putting together for their 7th anniversary. Or call them at 580-652-2418. 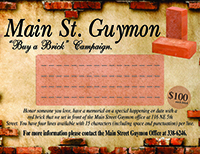 And if you like recipe books, you might pick up Main Street’s Guymon Farmers Market recipe book at Whispering Bliss Boutique at 1009 N. Main. The Luncheon at Masha’s with Jenna Blum (New York Times best selling author) has been changed to 5:30 – 7:00 at the Library and the tickets are $15 per plate. A great meal from Masha’s menu. Masha’s is the restaurant featured in Blum’s new novel, “The Lost Family.” Go by the library or Main Street Guymon to get a ticket. No tickets sold at the door. Panhandle Partner’s evening event is also Oct. 4, from 6-8 pm at Pickle Creek. BOP’s Craft for a Cause is Oct. 6 and has a Christmas theme with the proceeds going to Christmas Cheer for Children. Call the bank to make your reservations. The Special Game Day for folks with special needs is going to be Sun., Oct. 7, at the OPSU Baseball Field. For more information, call 338-6246. It’s great fun! And if you like to make cookies, we would love to have some to go with the Seaboard hot dogs. The Business and Breakfast Class at BOP is Oct. 9 and is about taxes. The class is open to everyone, free of charge, and BOP provides breakfast. It starts at 8 am and runs for an hour. Dr. Dan Mains is coming to Guymon on Sun., Oct. 14, to share with us interesting facts on the Ethiopian and Eritrean cultures. His lecture runs from 2 – 3 at the Guymon Public Library, 1718 N. Oklahoma. It’s free and we’ll have Ethiopian coffee served, too! Fall is here and the weather is perfect for sitting on the patio. Enjoy! There is a folder in my desk that I drop things in that I find interesting. Lots of them are just cute. Some are funny. Some are thought provoking. Take a look in my file with me today. Here’s an article that talks about a church quilting group in Wisconsin. They call themselves the Cover Girls. What a hoot. Great name. But Nance has to make it better by writing, “Who said we are responsible?! I hope you do something silly and blame it on Pammy and Deets.” Yep, that’s the other two. Nance always has such good advice. Dianna Brown taught the first class of the Career Focus last week and she asked the class, “What draws you to other people?” The answers came from the 15 class members and varied, but included intelligence, honesty, positivity, kindness, responsibility, compassion, and confidence. Dianna then stressed that these are the same qualities that we need to present to have people drawn to us. That sounds simple, but it’s actually very deep. To have friends, you need to know how to be one. All good words. And we can say they’re good words, but they tell us to act and do, not just hear. That’s the hard part, isn’t it? While you’re thinking on that, ponder taking part in these community activities. Charles White Insurance is sponsoring the Beard Contest at the Farmers Market on Saturday. That’s Sept. 22 and there’s monetary prizes! The Chamber of Commerce banquet is Tues., Sept. 25. This is when the Citizen of the Year is named and several other great awards like Volunteer of the Year and Small Business of the Year. Hope you sent in a nomination. On Oct. 9, the second Tuesday of the month, is the BOP Business and Breakfast class, “Taxes Don’t Have to be Taxing.” No matter how much you know, you can always learn something at these classes. They run from 8 – 9 in the morning and BOP serves you breakfast. The class takes place in the BOP board room. The Special Game Day at OPSU is on Sun., Oct. 7. This is for folks with special needs to have their day with their team playing baseball. The OPSU Baseball team facilitates it and it’s one of the best events on earth. A goal is to have the stands filled with people to encourage the team. The game starts at 4 pm and we hope you can be there. There are also free hot dogs from Seaboard Foods, free snowcones from Charles White State Farm Insurance, free watermelon from PTCI and more great things!